The following is a complete list of all the settings that will be roamed or backed up in Windows 10. See the following table for a summary of the devices and account types that are supported by the sync, backup, and restore framework in Windows 10. Windows settings generally sync by default, but some settings are only backed up, such as the list of installed applications on a device. Backup is for mobile devices only and currently not available for Enterprise State Roaming users. Backup uses a Microsoft account and stores the settings and application data into OneDrive. If a user disables sync on the device using the Settings app, application data that normally syncs becomes backup only. Backup data can only be accessed through the restore operation during the first run experience of a new device. Backups can be disabled via the device settings, and can be managed and deleted through the user’s OneDrive account. The following settings groups are available for end-users to enable/disable settings sync on Windows 10 devices. Theme: desktop background, user tile, taskbar position, etc. 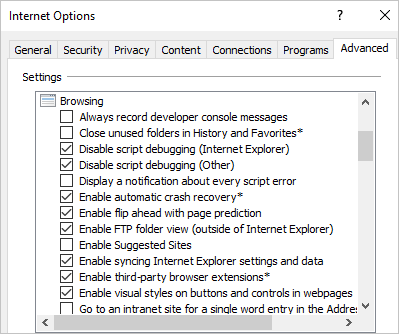 Internet Explorer Settings: browsing history, typed URLs, favorites, etc. 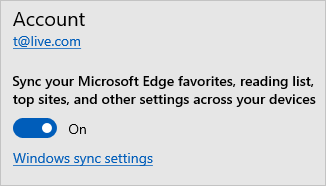 Microsoft Edge browser setting group (favorites, reading list) syncing can be enabled or disabled by end users through Microsoft Edge browser Settings menu option. For Windows 10 version 1803 or later, Internet Explorer setting group (favorites, typed URLs) syncing can be enabled or disabled by end users through Internet Explorer Settings menu option. In the following table, Other entries in the Settings Group column refers to settings that can be disabled by going to Settings > Accounts > Sync your settings > Other Windows settings. Internal entries in the Settings Group column refer to settings and apps that can only be disabled from syncing within the app itself or by disabling sync for the entire device using mobile device management (MDM) or Group Policy settings. Settings that don't roam or sync will not belong to a group. Minimum supported OS version of Windows Creators Update (Build 15063). For an overview, see enterprise state roaming overview.